Auvergne The region of Auvergne is found in the centre of France, somewhat arid area of south central France. It covers about one-sixth of France It is much loved by walkers. Offering a spa and wellness centre, Au Nid d’hirondelles is located in Saint-Andre-de-Chalençon. The accommodation will provide you with a TV and a terrace. More There is a full kitchen with a dishwasher and a microwave. Featuring a spa bath, private bathrooms also come with a bath and a bath or shower. You can enjoy mountain view from all the rooms. At Au Nid d’hirondelles you will find barbecue facilities. An array of activities can be enjoyed on site or in the surroundings, including cycling, horse riding and fishing. The property offers free parking. 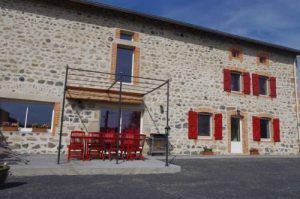 This holiday home is 84 km from Clermont-Ferrand Auvergne Airport. Score from 25 reviews: Exceptional 9.6 1 person is looking at this bed and breakfast. Featuring a private garden, La Maison de Barrouze is located in Salers, a 40-minute drive from Aurillac. Free Wi-Fi access is available at the property. More The non-smoking rooms offer a wardrobe and a private bathroom with a shower and hairdryer. Breakfast including local products, homemade yogurts and pastries is served every morning. The owner can help guests organise wine tastings in the region and restaurants can be found within 50 metres. Hiking and snowshoeing equipment are available for guests upon request. The property offers free parking. Apartments and studios at Apparthotel Privilodges Carré de Jaude all have a living area with a sofa, desk and flat-screen TV. Each has a private bathroom equipped with a bath or shower, hairdryer and free toiletries. Buffet breakfast is available daily for a supplement and guests can prepare meals using the kitchenette which includes a microwave, dishwasher and capsule coffee machine. Snacks are available, upon prior request at the reception. Restaurants and shops are located within walking distance of the property. The opera house is 300 m from the property and guests can golf at Golf de Royat de Charade, 7 km away or Golf des Volcans, 10 km away. Vulcania educational amusement park is 15 km away. Clermont-Ferrand Train Station is 2 km away and access to Motorway A71 is 5 km from the property. In the northern part of Auvergne one finds the fertile tertiary basin of the Limagne, where dairying and beef cattle diversify the traditional wheat economy. For the most part, however, the region is known for its breathtaking mountain ranges and volcanic peaks, offering views of a lunar landscape pitted with huge craters and outcroppings. The Puy de Dôme (1,463 m/4,800 ft) is the highest of a chain of recent volcanic peaks (the Monts Dôme, which became extinct some 4000 years ago) overlooking Clermont-Ferrand from the west. The Celts considered it a royal mountain, on which they worshiped their god of war. In the bleak, depopulated southern part of the Auvergne, the volcanic Plomb du Cantal reaches 1,858 m (6,096 ft). The highest point in central France is claimed by the Puy de Sancy in the Monts Dore chain, rising 1,886 m (6,188 ft) and serving as the source of the Dordogne River. Visitors can reach the peak by cable car from the town of Le Mont-Dore, followed by a walk. The history of the Massif Central, so ancient that it can only be appreciated on a geological timescale, is explained in a number of museums, including a major new museum of vulcanology planned near Clermont-Ferrand. It may be one of France’s least known and most sparsely populated areas, nevertheless Auvergne is a region that promises fun, adventure and plenty of opportunity to escape the hectic pace of modern life. Our spacious holiday homes in Auvergne give you the chance to unwind at the spas of Vichy, first made famous by the letters of the Marquise de Sévigné, then head out for an exciting day of mountain biking or perhaps even a hot-air balloon ride over one of many volcanoes, something Auvergne is famous for. Take the family fishing or, if the kids need to expend some energy, hop over to La PAL theme park in Moulins for a breathtaking roller coaster ride! With more than 25 spectacular attractions and 500 animals, it is one of France’s most popular theme parks. Whatever you choose to do, Auvergne is sure to be a hit with everyone, both young and old! 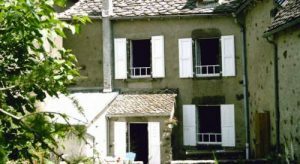 Holiday homes in Auvergne offer the peace and quiet of the French countryside In the Auvergne region of France the hustle and bustle of city life is something unheard of. In its place you will find the din of rushing rivers and abundant local wildlife. Take A Break Holidays takeabreakholidays, Auvergne Accommodation.